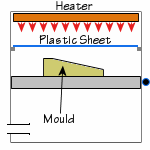 Vacuum forming is a fairly simple technique for shaping thermoplastics and is useful for large batches of work, for small runs of product vacuum forming is more cost effective than injection moulding as vacuum forming moulds are usually produced from wood and don’t require the same amount of machining or material costs. Vacuum forming has its limits on the shapes which it can form, this is because the moulds have to slide out from the inside of the vacuum formed plastic. This means that when the product is in its design stage the formed shape must be created with this in mind and usually means moulds are limited to a simple or tapered shape. Because vacuum forming uses large sheets of plastic extra machining may be required to smooth edges after it is cut out from the batch. 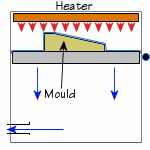 The mould is first placed on the bed, next the plastic sheet is placed on the shelf and heated untill it gains its required flexibility. Once the plastic is ready the bed is raised into the plastic and the vacuum is activated to draw any air out that is between the plastic sheet and the mould.